Fiat Chrysler Automobiles CEO Sergio Marchionne’s call for more large-scale consolidation in the global auto industry is being ignored so far, especially by executives at his No. 1 merger candidate: General Motors. Marchionne says the auto industry is broken because automakers waste billions on pointless r&d investment and destroy heaps of shareholder value in the process. He says companies must consolidate now or face “disastrous consequences” later. Despite this dire prediction, top GM executives have refused to meet with Marchionne. At the Frankfurt auto show last month, GM CEO Mary Barra said the automaker’s leadership as well as “expert advisers from the outside” have examined the prospect of a GM-FCA tie-up. “We’ve looked at it very, very carefully and in tremendous detail. And it’s not in the best interest of General Motors shareholders,” Barra said. A number of top European automotive executives shared their views with Automotive News Europe on the topic. Like Marchionne, Renault-Nissan CEO Carlos Ghosn believes that “smaller carmakers will need alliances and cooperations with bigger players” to cope with the huge investments needed to offer greener powertrains, connected cars and autonomous driving features, but he is skeptical about mergers because so many of them have failed. PSA/Peugeot-Citroen CEO Carlo Tavares said that the advantages of size -- such as better pricing from suppliers because of the higher volumes and a lower r&d amortization cost per unit built -- need to be balanced with the importance of remaining agile. “I have not found the perfect number to match size with agility yet,” he said. In his view, CEOs should concentrate on increasing efficiency by better utilizing their resources rather than growing just for the sake of volume. “The new norm is frugality: to do more with less,” he said. GM’s Barra, who on multiple occasions has publicly swept aside Marchionne’s advances, said in June, “We have scale,” and she said GM is busy “merging with ourselves.” Marchionne admits joining with GM would be a challenge, but he stands by his claims. “The benefits are so high that I don’t think you can stop the machine”. Compared with its larger and far richer global counterparts, FCA faces a set of problems that appears almost insurmountable. FCA trails its competitors in profit margin, r&d spending, fuel economy, hybrid technology, self-driving cars -- you name it. At a time of unprecedented capital investment needs in the auto industry, FCA is the only major carmaker in the world with more debt than cash (see table above). He acknowledges his company has extreme challenges compared with larger global rivals. Many of them, he says, are because of the financial weakness and years of neglect as Chrysler was coming out of its 2009 bankruptcy. But to outsiders, including analysts, competitors and potential partners, FCA has issues that go well beyond the weakness inherited by merging Chrysler into Fiat six years ago. 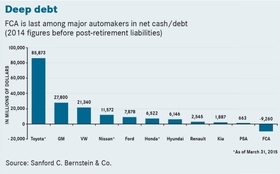 Of the world’s 11 largest automakers, only FCA has a net debt -- $8 billion. Many of FCA’s top-selling vehicles ride on platforms that would be considered out of date at other automakers. No single FCA platform underpins more than 1 million vehicles a year, increasing costs. All FCA platforms are reworks of architectures Marchionne found when he joined Fiat in 2004 and took over bankrupt Chrysler in 2009. To meet crash standards, each new model had to be heavier than its predecessor. That means higher fuel consumption as competitors launch lighter models on new platforms. So over time, the weight disadvantage increases for FCA. Today, with the exception of a $1.4 million LaFerrari supercar already sold out, you can’t buy a hybrid from any of FCA’s 11 brands. You can, however, purchase a battery-electric Fiat 500e in California and parts of Oregon, but not in Europe. And if you do it, FCA will lose about $14,000 on the transaction, Marchionne has said. While companies such as Toyota, Ford and Hyundai-Kia sell the same products in China, the U.S. and Europe, FCA is still the sum of multiple marginally interconnected regions, with shrinking sales in economically stricken Brazil and a negligible presence in Asia-Pacific, at least for now. 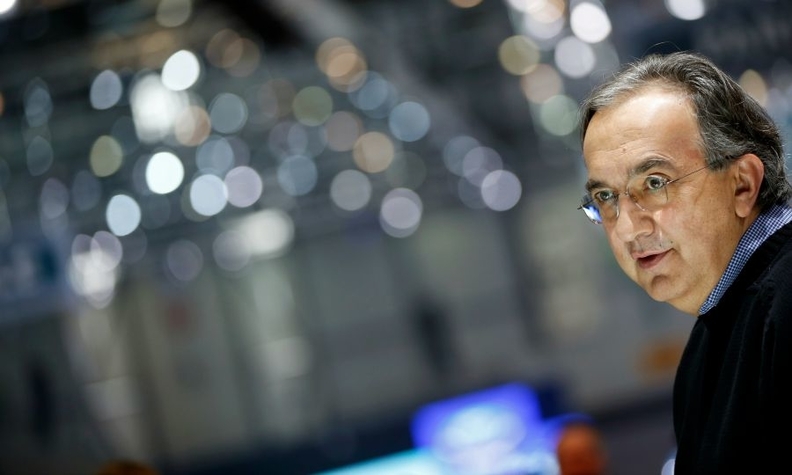 Marchionne acknowledges FCA’s challenges. Work to do on hybrids? “Absolutely true.” Lower margins compared with competitors in Europe and North America? “Absolutely true.” As for catching up when it comes to electrification? It’s coming, Marchionne said, and largely “from the supplier base.” Hybridization will be spread across the lineup, starting next year with the next-generation Chrysler Town & Country minivan. Given the various challenges ahead of FCA -- and its limited financial resources to face heavy investments for greener internal combustion engines, electrification and autonomous driving as well as its high debt level and subpar profitability -- Marchionne’s preferred shortcut is partnering with someone who already has all these technologies ready or in the works. GM is Marchionne’s preferred target, but he does not seem to be making any progress with his merger plan. Without a deal, “we end up staring at an ugly industrial machine that keeps chewing up capital,” Marchionne said, “and we live in perennial terror of just getting something wrong or something going sideways.” Without a mega-partner, the perennial terror at FCA will only increase.